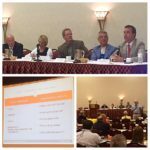 Matthew Monson sat on Sunday’s Perpetuation Panel Discussion at the Louisiana Professional Insurance Agents Convention in Point Clear, Alabama. We want to thank Mike Manes with Square One Consulting for being today’s moderator during the discussion. Pictured are Charlie Williams, Dr. Christine Berry, Brian Duplantier, Gene Galligan and Matt Monson, Esq. Click here to view pictures!